Bangabondhu, Bangladesh and our independence have very closed relation. Bangabondhu Sheikh Mujibur Rahman had one of the great nationalizes leader in the world. Bangabondhu (http://www.humanrightstoday.info/?p=714) was the pioneer and architect of independent Bangladesh and its sovereignty. His political prudence, indomitable courage, eloquence and powerful leadership motivated the countrymen to join in the war ofliberation. Bangabondhu proclaimed independence on March 26 in 1971 and the people dived into nine months long bloody battle and achieved the long desired sweetest freedom, He also gave restless effort to represent an esteemed Bangalee nation on the world stage. His golden-etched name will remain in the history of Bangalees and Bangladesh forever. But our nation has been waiting from 34 years for justice his brutal murders. August 15 in 1975 is a black-chapter in the history of Bangalee nation. Bangabondhu and his family members were ruthlessly murdered by anti liberation force and with the help of army member in this day. And the nation incurred an irretrievable loss. The nation is deeply shocked and full with grief for this shameful incident. Now, Prime Minister Sheikh Hasina, the daughter of Bangabondhu is the main target by killer's group especially Islamic militant group. The country today observes National Mourning Day on the 34th death anniversary of Father of the Nation Bangabondhu, with a vow to implement the longstanding High Court verdict in the case in connection with his murder. The day is a public holiday. The government chalked out nationwide programmes to observe the day at the state level. Prime Minister Sheikh Hasina (she is a daughter of Bangabondhu), will visit her father's grave at Tungipara under Gopalgonj district today. Along with ruling Awami League (AL), different political parties, and student and socio-cultural organizations also planned programmes to mourn the killings of Bangabondhu and most of his family members on this day in 1975. Three separate attacks on this day 34 years ago left 24 people killed. Bangabandhu's two daughters -- Sheikh Hasina and Sheikh Rehana -- could escape the bloodbath as they were abroad at the time. 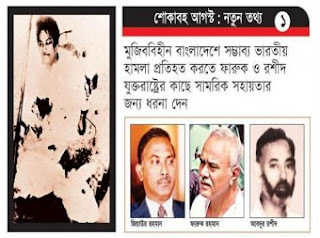 The victims also including wife of Bangabondhu Begum Fazilatunnesa Mujib, sons Sheikh Kamal, Sheikh Jamal and nine-year-old Sheikh Russell, daughters-in-law Sultana Kamal and Parveen Jamal, brother Sheikh Naser, nephew Sheikh Fazlul Huq Moni and his wife Begum Arju Moni, brother-in-law Abdur Rab Serniabat, 13-year-old Baby Serniabat, Serniabat's son Arif and four-year-old grandson Babu, three guests, Bangabondhu's four domestic helps, and his security chief Col Jamil Uddin Ahmed. Bangabondhu united the Bangalees to throw off the shackles of Pakistani oppression and steered them towards independence. His stirring speech on March 7, 1971, before a crowd of lakhs ready to stake everything for freedom, left an indelible imprint on the nation's memory. For 21 long years, his killers had been immune from prosecution due to the Indemnity Ordinance, which was finally repealed in 1996, paving the way for trials of the killers. A murder case was filed on October 2, 1996. In November 1998, a trial court awarded death penalty to 15 former army officers for killing Bangabondhu and his family members. The High Court (HC) upheld the death sentences of 12. Five of the condemned -- dismissed army personnel Lt Col Syed Farooq-ur Rahman, Lt Col Sultan Shahriar Rashid Khan, Lt Col Muhiuddin Ahmed, Maj AKM Mahiuddin Ahmed, and Maj Bazlul Huda -- are behind bars while six are hiding abroad. Another condemned Aziz Pasha died. The five condemned convicts filed separate appeals with the Appellate Division of Supreme Court in the last week of October 2007 against their death sentences pronounced by the HC.Law Minister Shafique Ahmed recently told journalists that hearings of the appeals will start soon as there is no shortage of judges in the Supreme Court now. The condemned six still at large are Shariful Haque Dalim, AKM Mahiuddin, Rashed Chowdhury, Nur Chowdhury, Abdul Mazed, and Moslemuddin. In the daily Star published a special report on 15 August of 1975. The report says. Islamic radicalism, menacing the nation for years now, was something India and the United States learnt to dread soon after the assassination of Bangabondhu Sheikh Mujibur Rahman. Documents lately declassified by the US Office of the Historian show the apprehension had its roots in the perception that Bangabondhu's killers--all military officers--were “pro-US, anti-Soviet Union, Islamic, and less pro-Indian than the past leadership”. 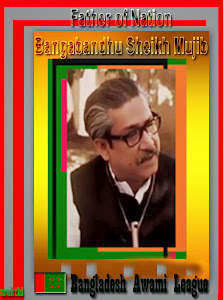 The August 15 bloodbath in 1975 left Mujib and most of his family butchered and his party in total disarray. It led to the assumption that Pakistan would regain its sway on the nation it sought to subdue only a few years back. In the context of the cold war dynamics, India and the US were also concerned that China, which recognized Bangladesh only after August 1975, might help radical communist elements thrive in the delta sliding into militocracy. All these worries were reflected in a conversation between the then US secretary of state Henry Kissinger and Indian external minister YB Chavan. YB Chavan: The new president [Khandaker Mushtaque Ahmed] has sent us assurances that he was standing by the same policy but we are concerned, in particular, whether the new government will take an extreme Islamic posture. This would create problems for the minority in Bangladesh. If the Hindus again feel insecure, there might be a new wave of refugees. Kissinger: Is there a large minority group in Bangladesh? Chavan: About 15%. It is a major factor. So far the new government (after Mujib killing) has given assurances it would follow the same policy as Mujib, but we are naturally worried about the influence of Pakistan on Bangladesh. Kissinger: What is your impression? Chavan: They have just announced diplomatic relations. This is a good thing. Even under Mujib we recommended this. We never wanted an exclusive relationship with Bangladesh. Our worry is only this: That they might try to give a different connotation to the situation by giving an Islamic twist to things. Also the Chinese recognized [Bangladesh] only after the coup. Frankly, we are worried. There are radical communist elements in Bangladesh which the Chinese might try to help. Here we hope the US and India will have a common approach. After a while, Kissinger asked his Indian counterpart, “What is the tendency of the [Bangladesh] military? Is it anti-Indian?" Chavan replied, "Frankly, there is some anti-Indian tendency, I am sorry to say." At this point, Kewal Singh, the then secretary of Indian external affairs ministry, chipped in, "Some people hostile to Mujib were brought back. We don't want to give the impression we are concerned but pro-Islamic and pro-radical groups have some strength." Chavan and Kissinger met the following day as well and talked about Bangladesh. Almost immediately they got down to serious talking about political ramifications of the August 15 coup d'état. Yet again, the Indian minister said, "We are worried about Bangladesh. Radical movements are already there. If Pakistan and China converse their efforts, this could pose a problem. This would be a new factor in South Asia which needs assessment." The secretary of state said, "Previously, the Chinese were opposed to Bangladesh. They were not among Mujib's admirers." As he asked if India had any advance indication of the coup, his opposite number replied, "None." TN Kaul, the then Indian ambassador to the US, added, "The danger is Pan Islamism." At one point, Kissinger said, "The real worry would be if countries with resources like Saudi Arabia get radical leaders. Then there would be trouble." Kaul said, "One reason why we banned the Jamaat Islami and RSS is that these parties were getting money from the outside." The Kissinger-Chavan meeting gives an impression that none of the two countries had prior knowledge of the military takeover. But the US state department's documents suggest quite the contrary. They show that like India, the US had gathered that something sinister was brewing, and it had even informed Bangabondhu about it. Minutes of a staff meeting headed by Kissinger after August 15, show that the US was well aware of the plot. There, Kissinger was heard enquiring Alfred Atherton Jr., assistant secretary of state for Near Eastern and South Asian affairs in 1974-1978, about the assassination. Atherton said the US had lots of indications in March that some quarters were scheming to kill Mujib. Kissinger asked, "Didn't we tell him [Mujib] about it?" The assistant secretary of state said, "We told him at the time." As his boss pressed to know if Bangabondhu was told who it was going to be, Atherton answered, "I will have to check whether we gave him the names." At that point, Hyland of Bureau of Intelligence and Research said, "We were a little imprecise on that." Referring to the US alerting Bangabondhu to the danger of an attack on him, Atherton said, "He [Mujib] brushed it off, scoffed at it, and said nobody would do a thing like that to him." Kissinger remarked, "He was one of the world's prize fools." Talking about the coup leaders, Atherton said, "They are military officers, middle and senior officers, who are generally considered less pro-Indian than the past leadership; pro-US, anti-Soviet." The secretary of state responded, "Absolutely inevitable." And Atherton went on, "Islamic. They have changed the name to the Islamic Republic” Kissinger said, "That they would be pro-US was not inevitable. In fact, I would have thought at some turn of the wheel they were going to become pro-Chinese, and anti-Indian I firmly expected. I always knew India would rue the day that they made Bangladesh independent. I predicted that since '71." Major Dalim, one of the on-the-run convicted killers of Bangabondhu, in a radio announcement soon after the killings declared the country would now be named "Islamic Republic of Bangladesh". The declaration which eventually did not materialise was a complete contrast to the secular ideals that stirred Bangalees to fight for independence from "Islamic Republic of Pakistan" in 1971. Though the republic's name was spared a change, its constitution soon lost secular character. The original charter saw secularism dropped as one of its four fundamental principles. It also had 'Bismillahir Rahmanir Rahim' in the preamble. Even more alarming was the scrapping of the ban on religion-based political parties. During the rule of Ziaur Rahman, five parties including Jamaat-e-Islami, which collaborated with the Pakistani occupation forces and committed genocide and numerous atrocities during the Liberation War, were allowed to be in politics again. The government of independent Bangladesh in its first decision banned these parties that always oppose the nation's independence and thrive on communal disturbances. In the early 80s, the country's second military ruler HM Ershad introduced Islam as state religion, dealing a death blow to secularism. The rise of Islamist militancy, once a fear, is a reality now, 34 years after the August 15 carnage. During the BNP-Jamaat-led rule in 2001-2006, Islamist outfits spread tentacles across the country thanks to patronage from some influential leaders of the ruling alliance. Though the BNP government woke up to the dangers of militancy towards the end of its tenure, it was too little too late. Now the task lies with Awami League-led grand alliance that came to power on promises that include the one to root out militancy. And at the centre stage in the combat against militancy is Prime Minister Sheikh Hasina, who herself had been the target of several attacks. You can agree or disagree with his political philosophy, but even his enemies have no doubt about the patriotism of this man: Sheikh Mujibur Rahman, the founding father of Bangladesh. He spent most of his life fighting against the injustice bestowed upon Bangalees, first by the British, and then by the Pakistani Panjabi military/civil junta. After the mass uprising of 1969, he was given the title "Bangabandhu", means "Friend of Bengal". 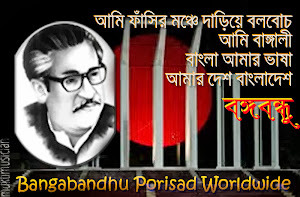 He is largely known as Bangabandhu among the millions of Bangalees. History of Bangladesh is largely interconnected with the life of Bangabandhu. He was a young political activist during the British rule. He was active in every political event of then East Bengal/East Pakistan: the Language Movement of 1952, Jukta Front election of 1954, Student Movement of 1962, 6-Point Demand of 1966, Mass Uprising of 1969, and finally Bangladesh Liberation War of 1971 against the Pakistanis. He was imprisoned more than a decade during the 24-years of Pakistani rule. What the Pakistanis could not do, some corrupt military officers were able to do so in our own soil. They killed Bangabandhu along with most of his extended family in August 15, 1975, just after 3 and 1/2 years of independence. 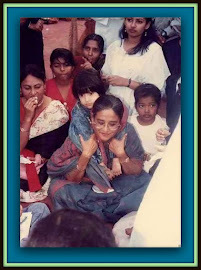 Two of his daughters, Shiekh Hasina and Sheikh Rehana, survived. In November 4, 1975, they killed 4 national leaders, cornerstone of our Liberation War: Syed Nazrul Islam, Taz Uddin Ahmed, Captain Mansoor Ali, and Kamrujjaman. 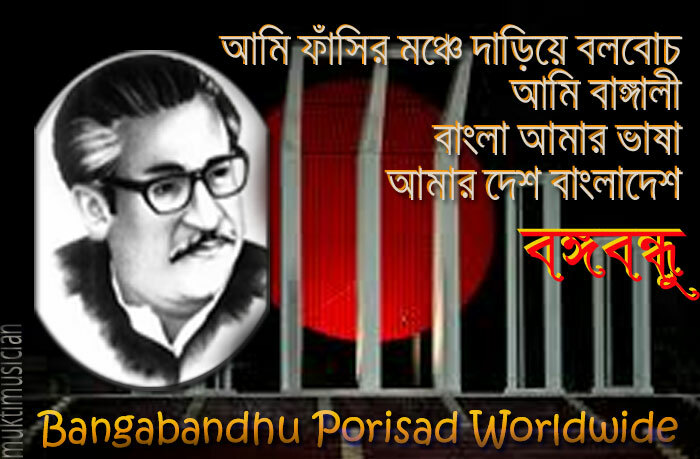 Without a doubt, Bangabandhu is the greatest Bangalee of our known history. He gave us a nation, a new country, a new identity. Even today, he is more powerful as dead than anyone of us alive. 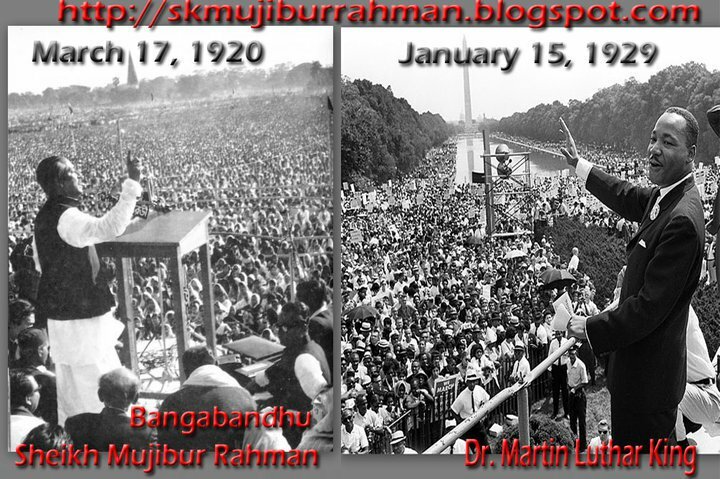 The murderers of Bangabandhu should be bringing back.